Set in the old Mowbray Town Hall, you’ll find a curious and hilarious bunch of monsters. 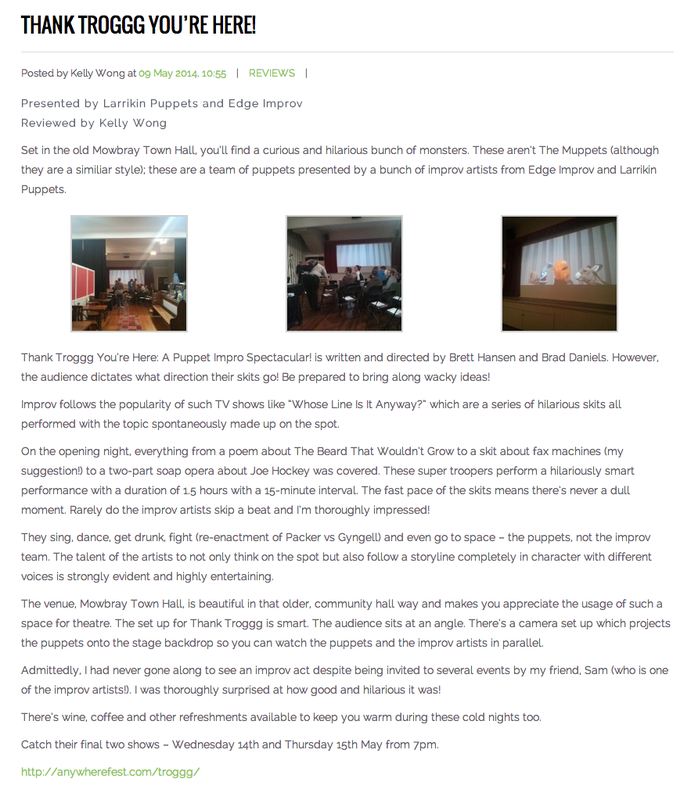 These aren’t The Muppets (although they are a similar style); these are a team of puppets presented by a bunch of improv artists from Edge Improv and Larrikin Puppets. Thank Troggg You’re Here: A Puppet Impro Spectacular! is written and directed by Brett Hansen and Brad Daniels. However, the audience dictates what direction their skits go! Be prepared to bring along wacky ideas! Improv follows the popularity of such TV shows like “Whose Line Is It Anyway?” which are a series of hilarious skits all performed with the topic spontaneously made up on the spot. On the opening night, everything from a poem about The Beard That Wouldn’t Grow to a skit about fax machines (my suggestion!) to a two-part soap opera about Joe Hockey was covered. These super troopers perform a hilariously smart performance with a duration of 1.5 hours with a 15-minute interval. The fast pace of the skits means there’s never a dull moment. Rarely do the improv artists skip a beat and I’m thoroughly impressed! They sing, dance, get drunk, fight (re-enactment of Packer vs Gyngell) and even go to space – the puppets, not the improv team. The talent of the artists to not only think on the spot but also follow a storyline completely in character with different voices is strongly evident and highly entertaining. The venue, Mowbray Town Hall, is beautiful in that older, community hall way and makes you appreciate the usage of such a space for theatre. The set up for Thank Troggg is smart. The audience sits at an angle. There’s a camera set up which projects the puppets onto the stage backdrop so you can watch the puppets and the improv artists in parallel. Admittedly, I had never gone along to see an improv act despite being invited to several events by my friend, Sam (who is one of the improv artists!). I was thoroughly surprised at how good and hilarious it was! There’s wine, coffee and other refreshments available to keep you warm during these cold nights too. Catch their final two shows – Wednesday 14th and Thursday 15th May from 7pm.